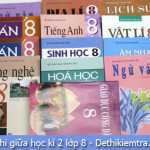 Đề thi giữa kì 2 lớp 6 Toán, môn Tiếng Anh trường THCS Hồng Thái – Ninh Giang năm 2016. 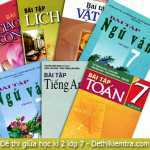 Thời gian làm bài 90 phút. 3 (2 điểm). 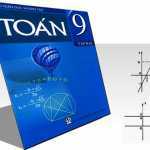 Tìm cặp số nguyên (x, y) biết. 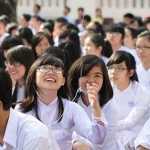 4 (1 điểm). So sánh 2a và 3avới a là số nguyên. B.She wants to swim at the park. C.She wants to go down to the beach. Read the passage then decide the statements true or false. Quang is a gymnast. He is tall and thin. He has short black hair. His eyes are brown. He has a round face and thin lips. Quang is having dinner at the moment. He is eating fish. He often has fish, meat and vegetables for dinner. After dinner he eats bananas. Then he drinks orange juice. He feels full after dinner. …………….1. Quang is a student. …………….2. Quang is short and big. …………….3. He has short hair. …………….4. His hair is white. …………….5. He has brown eyes. …………….6. Quang’s face is round and his lips are full. …………….7. Quang is having a bath at the moment. …………….8. He is eating vegetables. …………….9. He often has dinner with fish, meat and vegetables. ……………10. Quang feels hungry after dinner. Match a question in column A with an answer in column B. 1. What’s the weather like in the spring? 3. What do you do when it’s cold? 4. How often do you play volleyball? 5. When do you often go swimming? 6. Where do you go fishing? 7. Who do you usually play badminton with? 9. How do you go to school? 10. Which sport do you play? a. I play it once a week. b. I usually play with my sister. e. I often play basketball when it’s cold. f. I often go swimming on the weekends. g. I like cool weather. h. I go fishing in the river near my house. Write the activities you do in four seasons.